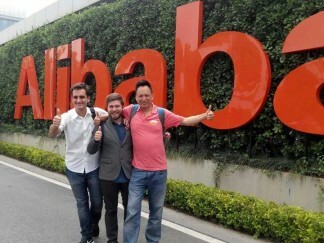 Alibaba is one of the world´s most exciting and vibrant start up and well, yes… the biggest online commerce company in the world (handling hundreds of millions of users, and hosting millions of merchants and businesses) and it was the highest IPO in history of the US. Jack Ma (马云) , co-founder, executive chairman and bizarre leader of the Chinese E-Commerce giant Alibaba Group, wants to make sure that Alibaba lasts for 100 years (a way for Chinese to show they are serious about creating a corporate-legacy). So it looks like this flourishing of Alibaba will not stop now that they cover the 80% of China’s online shopping market, but they will go global now. (more info here). To accomplish this global new vision, Jack Ma has a new ally, Daniel Zhang the new CEO of the company with 2 clear objectives: make Alibaba even bigger and transform company culture to a Global Mindset to the upcoming internationalization process of Alibaba. “We need to have global talent. We will have employees from all over the world that look different from each other” were some of the words of Zhang on his welcoming speech. Alibaba Group got two main tools to face the global market: Tmall Global, which lets international companies sell directly to customers in China and AliExpress a platform for international customers to buy products from China. In Chinese philosophy, Yin 陰 and Yang 陽 describes how apparently opposite or contrary forces are actually complementary, interconnected, and interdependent in the natural world, and how they give rise to each other as they interrelate to one another. The Yin represents the soft part, the emotions, the female energy and the moon. While the yang represents the hard, the logic, the male energy and the sun. And all these elements are combined in a constant flow looking for an harmonious way. As you can see, Alibaba’s Yang energy is quite clear and visible. But what’s behind this energy? 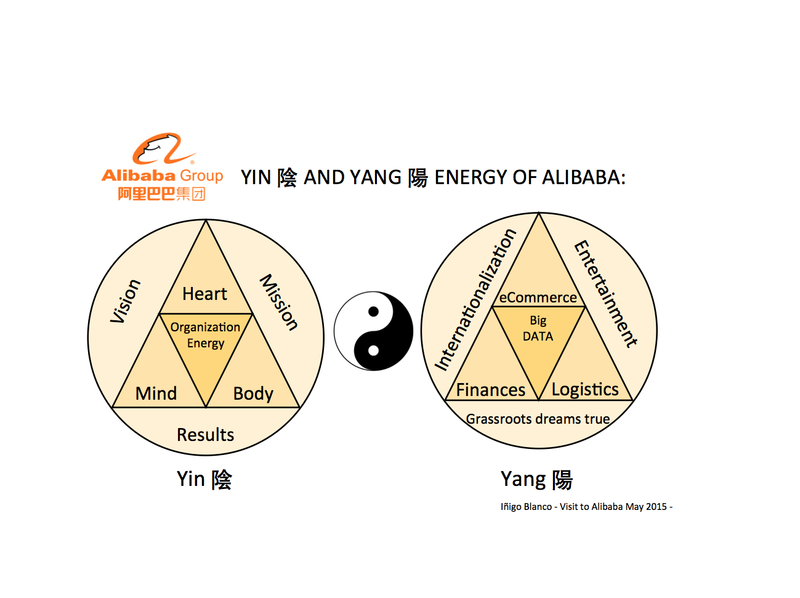 How does Alibaba’s Yin energy work? 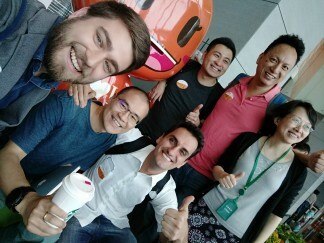 Thanks to our partners in China ‘Innovate Organizational Development Center (IOC-OD)’ and ‘Mondragon Team Academy China’ we have been able to visit Alibaba’s HQs in different occasions and get to know the Yin side of such an exciting company. Let’s start sharing that Alibaba is an extremely Yin – Idealistic and extremely Yang – Realistic company at the same time. While the KPIs are in the minds of all the staff all the time and everyday, at the same time they focus on the long term vision (transforming the civilization of business world and make grassroots entrepreneurs to fight the power back – kind of a thing) and therefore they are more flexible and able to react on their toes to face the tension between reality and future of the internet business. The essence of the company is to create an apparently almighty vision, share it with the world, and later on create a flexible strategy and passionate culture to make it happen. For that they need to create a flexible enough structure of allow sky and land sustain the needs and dreams of customers (1st), employees (2nd) and stakeholders (3rd). 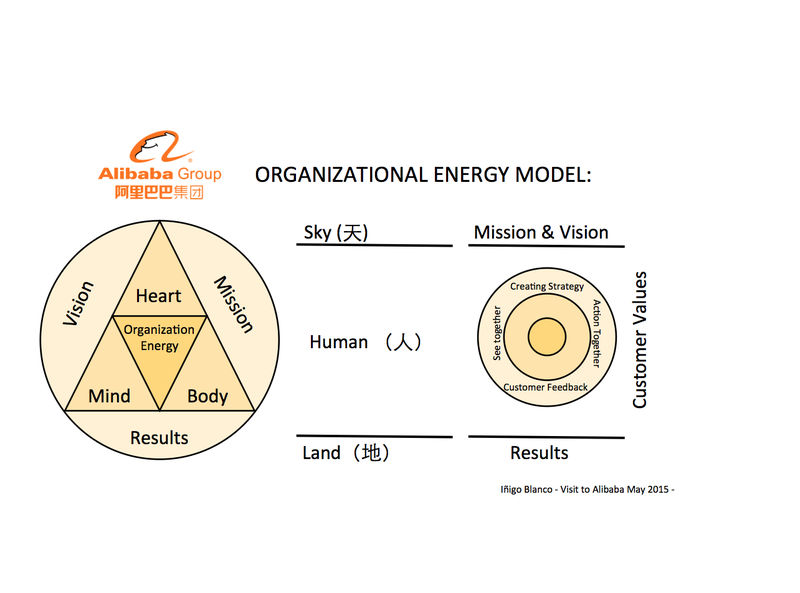 While the Yang energy of Alibaba is focused on the creation of online marketplaces, entertainment experiences, international logistics and strong financing structure (being a data-centric company) the Yin energy sustains the entrepreneurial culture, global mindset and creates a mind-body-heart connection between the leading thoughts of the company and the energy of each one of the employees and customers. PD: Iñigo wants to specially thank Maria, YuJiao and Yvonne (IOC-OD team) to make this possible and the MINNzer team for the great contribution to the Team-Entrepreneurship learning inside Alibaba.